This Home Page is now huge! Please scroll down to see everything or use our Search bar below! We have a variety of babies and some other piggies available for sale, please use the 'contact us' on Babies for Sale page if you are interested. This entertaining video of Beauvale piggies enjoying a treat of refreshing lettuce on a summer's day is courtesy of Gavin Barclay (all rights reserved). 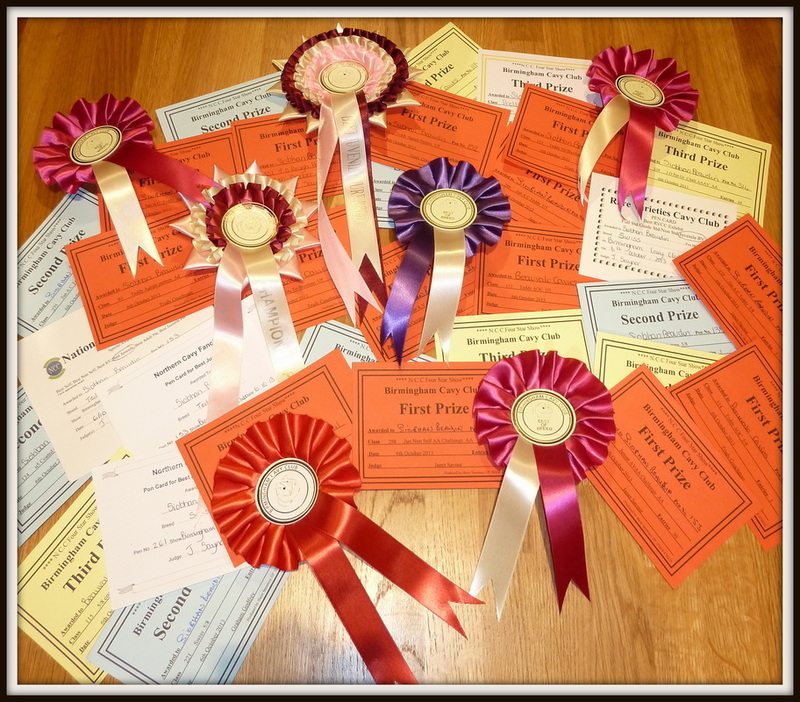 July 2014 - thirteen of our piggies won prizes at the Ashby Agricultural Show. It was a fantastic day with outstanding results. The girls want to thank Gill for her hospitality - the overnight stay in Ashby was very welcome! As always, there was too much rain and too little gossip! 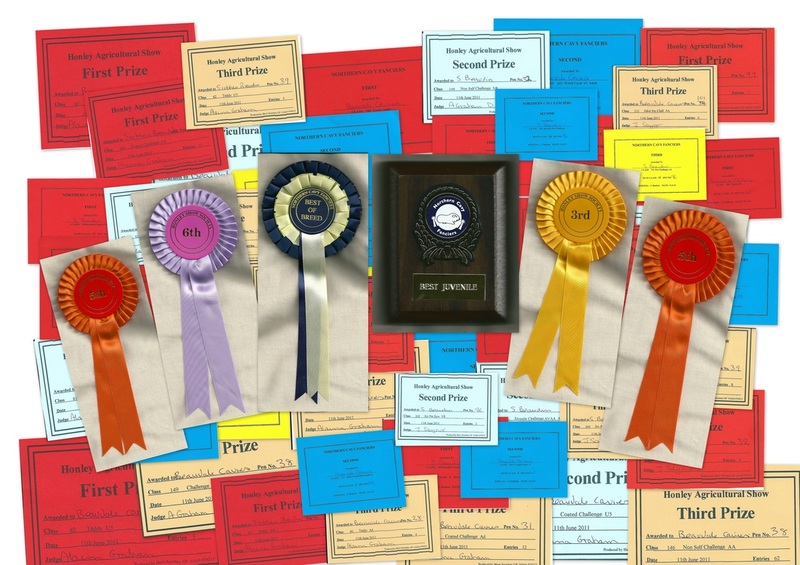 There were a couple of stunning debuts from Beauvale at the show and the 'BEST of' prizes included BEST 5/8 NS, BEST JUVENILE RV, BEST NEW & EMERGING BREED, BEST OF BREED x 2, and BEST JUVENILE. To see which piggies won these prizes, please click on China, Wordsworth, Zebedee, Lilly, Bruno, Trixie, Pandora, Socks, Belle, Pushkin, Sophie, Doris, and Casper! 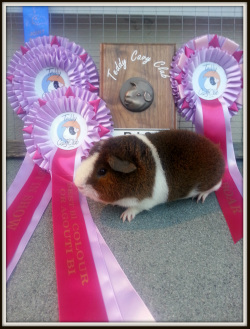 July 2014 - the Birmingham Cavy Club hosted a Teddy Cavy Club rosette show! We went all out in Birmingham by show our finest Teddys, our swankiest Swiss, and our new and emerging Minipli. It's the first time that we have shown a Minipli and we are extremely encouraged with the results. Little Sophie is going to be a star, she won Best New and Emerging Breed - a distinction normally reserved for some more established breeds! It took us a long while to update the web site this week, as FIFTEEN of our piggies won prizes in Birmingham. Siobhan won Best Juvenile with Socks in both shows and Best Juvenile RV with Doris! Our army of travellers wants you to see how they did - please click on Socks, Zebedee, Wordsworth, Sophie, Holly, Olga, Digby, Mystique, China, All that Jazz, Zippy, Bruno, Doris, Bailey, and Pandora. June 2014 - planning the expedition to Dunfermline takes weeks - the car needs to get serviced, the hotel needs to be booked, the bags need to be packed, and of course, we need to select the right piggies to make the trip worthwhile! Selecting the right piggies is always a mad scramble, checking coats, bathing and grooming, and ensuring they are hardy enough to handle the travel! The girls really enjoyed their day in Dunfermline, but the night in the hotel was an experience. Now we know why we don't sleep with our piggies in the house! The constant munching, water bottle slurping, and the odd 'rumbling' made for a sleepless night all around! Despite the all night party, the girls were awarded Second Best and Third Best in the Teddy Club show. To see our tired band of travellers did, please click on All that Jazz, Socks, Clementine, China, Melody, Zippy, Belle, Zebedee, Holly, Pandora, Momo, Doris, and Nellie. June 2014 - the Cheshire County Show is always in the middle of the week, so it attracts a dedicated, die hard crowd of enthusiasts. Beauvale took four debutantes to show on this sunny day in the Cheshire countryside. We had some fantastic results with Best Juvenile and Best Rare Variety awards and the day was a great success. To see how the Cheshire set did please click on Doris, Twinkle, Pandora, China, Nellie, Zebedee, and Socks! June 2014 - another day in the bright Penrith sunshine! What an amazing day for the 1st June! Five first in class finishes. An amazing debut for one of our lovely Swiss as well - guess which one! The Cumbria Cavy Club is growing in popularity and attracting exhibitors from far and wide. To see our visitors to the lake district did, please click on Azlan, Scooby, Heathcliffe, China, Pandora, Jack Frost, and Clementine. May 2014 - following on from the Staffordshire County Show during the week, the girls headed across the country to Lincolnshire for another show. The girls brought home the usual group of prizes but were really impressed with the three girls who made their debuts. To see how our cross county team did, please click on Pandora, Melody, Smokey Joe, China, Bobbi, Baby Jane, and Ariella. May 2014 - The Staffordshire County Show has become an annual event for Beauvale. Due to the popularity of this show, we decided to rest some of our veterans and allowed three of our youngsters to make their debuts. Along with enjoying a wonderful day in the sunshine, we had some good results on the day. To see how our little beauties did, please click on Pandora, China, Clementine, All that Jazz, and Azlan. May 2014 - on this beautiful spring day in Oldham, the girls brought home Best Juvenile, 3rd Best Juvenile, Best Juvenile R.V., and 2nd Best Rare Variety. That's very impressive! Although getting to the Oldham shows is not a long trip for the girls, it's always a good day! They meet good friends and always bring home a bit of news (or is that gossip?)! This show was about the boys - all about the boys and our little Precious! To see how the posse did in Oldham country, please click on Azlan, Bruno, Pushkin, Smokey Joe, Tigers Eye, Jack Frost, All that Jazz, and of course, Precious! April 2014 - travelling 120 miles each way to attend a show is a lot of hard work. Hazel and Siobhan are keen to meet as many fanciers as possible to gain the widest experience possible. Both Beauvale Cavies and Beauvale Junior made an impact at the Wyvern Cavy Club and the Western Area Fanciers shows! Between them they took all of the adult Teddy places. A special mention for our little Harry, a wonderful Swiss born in late January who was awarded Best Reserve Guide Standard in the show! To see how the rest of band of travellers did, please click on Harry, Azlan, Melody, Tigers Eye, Phoenix, Smokey Joe, Damson, Fabio, Bailey, Nellie, and Precious. April 2014 - another exciting day in Yorkshire. There were two amazing shows and fantastic auction supporting a variety of cancer charities! Both shows were well attended with hundreds of piggies. Some of the piggies were auctioned to grateful new owners. Beauvale had the pleasure of providing a few of our finest furry friends! Siobhan (now known as Beauvale Junior) was pleased to come home with Best Juvenile in the Teddy Club show. These rosettes from the Teddy Club are absolutely gorgeous! The girls were equally pleased to have brought home Second Best Boar (Bailey) and Third Best Boar (Azlan) from the Teddy Club show. To check the rest of our prize winners, please click on Azlan, Bruno, Tigers Eye, Bailey, Precious, Fabio, Smokey Joe, and Nellie! Our lovely Polka Dot won BEST IN SHOW in Penrith. She was only one of the many successes that our Beauvale clan had at the Cumbria Cavy Club show. We had two debuts with Nellie winning Best Juvenile RV for Siobhan, and our lovely Precious did her best against strong competition to take a Second place. It was a long road up the M6 to Penrith but a jubilant drive back with five outstanding trophies and five beautiful rosettes. To see how the fab five (and a few others) did in Penrith, please click on Azlan, Bruno, Nellie, Smokey Joe, Polka Dot, All that Jazz, Precious, Walnut, and Tigers Eye. March 2014 - week after week, the girls are brushing piggies, cleaning hutches, and feeding the mighty hoard! And it's nice to see all of their hard work rewarded. This trip to Lincolnshire is a huge logistics undertaking for Beauvale but it was certainly worth the effort. 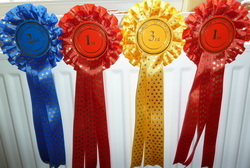 The girls brought home 9 rosettes and 80 prize cards from this day over the Penines. The combined show included Lincolnshire Cavy Club who were the hosts, Midland Cavy Club, and the Teddy Cavy Club. 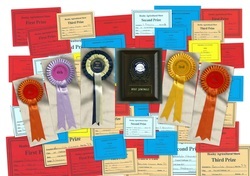 Each club show was judged independently and prizes were awarded accordingly. We had some impressive results on the day. Polka Dot was judged Third Best Teddy in the Teddy Cavy Club show and Third Best in Show overall in the Lincolnshire Cavy Club Show! Azlan secured the Best Teddy Juvenile award, while Tigers Eye was selected Best Teddy Boar in the Teddy Cavy Club show. 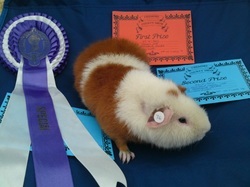 Sherbert followed with Best Juvenile RV in both the Midland Cavy Club and the Lincolnshire Cavy Club shows. All of our piggies won some wonderful prizes! To see how the prizes were shared, please click on Tigers Eye, Azlan, Hugo, Smokey Joe, Polka Dot, Walnut, Suzi, and Bruno. March 2014 - this trip to the Midlands was encouraging! Six of our piggies managed to collect 3*** NCC stars! Siobhan was in her element bustling around meeting new friends and adoring all of the piggies on show! 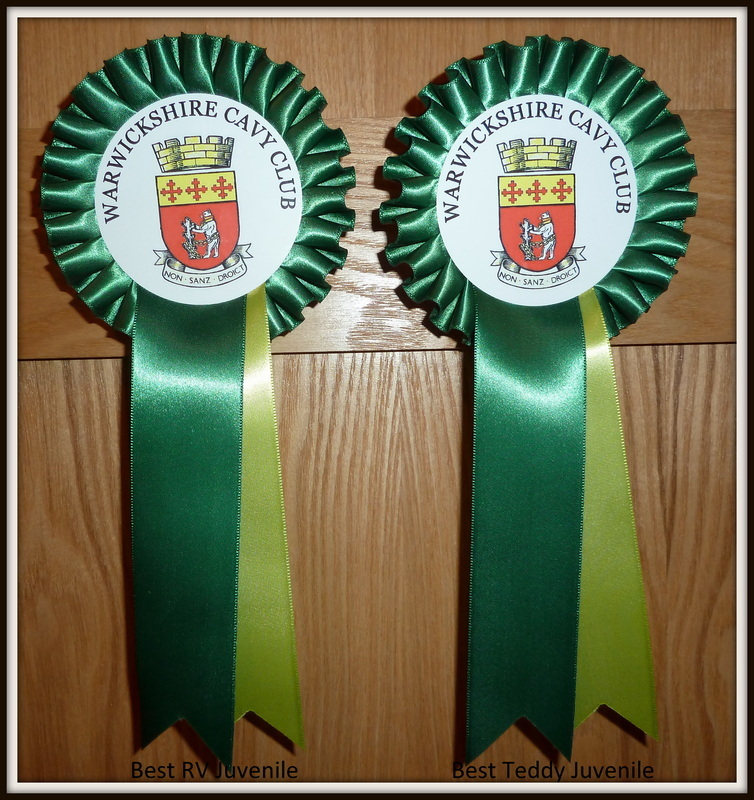 We want to thank our lovely hosts at the Warwickshire Cavy Club for an outstanding show! Angel Eyes and Bruno brought home these fantastic rosettes! To see how our intrepid travelers did this week, please click on All that Jazz, Polka Dot, Jack Frost, Zippy, Angel Eyes, Bruno, Sherbert, Azlan, Topaz, and Tiger's Eye. March 2014 - these arrived during the week. A collection of Siobhan's prizes awarded by NCC for past shows! March 2014 - As usual, the competition at Oldham is very strong but that doesn't stop us from having a fantastic time! We always look forward to visiting Oldham. We completely shocked Guy when we arrived home with a clutch of piggies from Lorraine. He's over the moon with all of the new faces and will be updating the web site over the next couple of weeks. We all wish Lorraine a speedy recovery! Bruno and Oscar brought home the biggest honours this week, while Polka Dot and Katie won their classes! To see how our boys and girls did in Oldham, please click on Bruno, Oscar, Katie, Polka Dot, Zippy, All that Jazz, and Tigers Eye. March 2014 - Another happy day at the Warrington show! Beauvale's little troupe did extremely well, especially Siobhan's team! Siobhan faced some serious competition in the juvenile classes. Her friend Chris' little golden was a real contender. We want to congratulate Mel Bell on winning the show with her Teddy - a very special Beauvale Hazel. An amazing result. Bruno and Sherbert brought home a couple of quality rosettes. To see how the happy team did, please click on Oscar, All that Jazz, Sherbert, Bruno, Polka Dot, Tigers Eye and Zippy. March 2014 - the Worth Valley Fanciers Show is a new show for us at Beauvale! Worth Valley is the first of a string of weekly shows that will take us to Easter. We had some exciting results for an old pro and new youngster! The old pro is All that Jazz, he was selected Best Adult Boar in the Teddy class and had a string of great Challenge results. The youngster is Bruno, he was selected Best U/5 Teddy with a string of 'best' results in the Challenges. We also showed a few of our new Teddys and a couple of Swiss. To see how they did, please click on Bruno, Topaz, Marmite, All that Jazz, Tigers Eye, Oscar, Suzi, and Zippy! January 2014 - what a weekend! The Harrogate show starts off the year with a bang! Last year when we attended our first Harrogate show as Beauvale, there was a huge snow storm! This year, there was enough wind and rain to rival the Wizard of Oz! Thankfully, the show is not about the weather, it's about the piggies. This year we took some of our finest Teddys and our new batch of Swiss. They all did really well considering how many piggies are brought to this show. Siobhan's hard work is continuing to pay off, she took Chance (Swiss) and won Best RV Juvenile while Patience (Teddy) won Best Juvenile in the Teddy Cavy Club show. The girls brought home an assortment of trophies and rosettes. To see how our piggies did, click on Mouse, Chance, Scarlett, Topaz, Tigers Eye, Patience, All that Jazz, and Bruno! January 2014 - at Harrogate, the Teddy Cavy Club awarded their members trophies for Points accumulated during shows in 2013. These impressive mementos are a fantastic way to recognise those members who put in the time and effort to improve our Teddy stock in the UK. We were fortunate to receive four awards for 2013. Beauvale was the TCC Rosette Shows winner for 'Best Bi-Colour or Agouti Bi Section'; 'Best U5 Section'; while Siobhan was the winner for TCC Points Shows 'Best Juvenile Exhibitor'; and TCC Rosette Shows ' Best Juvenile Exhibitor'. October 2013 - the short trip to Hyde and Glossop was attended by our usual posse of beauties! Hazel and Siobhan took 8 to the show and brought back Best Juvenile Rare Variety, Best Juvenile, 2nd Best Juvenile, and and amazing Best of Breed rosette! These results are testament to the love and hard work that we all enjoy! A special mention goes to our Melody who is continuing to take the shows by storm! To see how the day trippers did, please click on Skyfall, Dolly Daydream, All that Jazz, Tiger Lilly, Snowman, Twiglet, Randolph, and Melody! October 2013 - it was another adventure into the Lake District! The Cumbria Cavy Club is becoming a popular show for cavy fanciers. Although the day was excellent - we couldn't believe the thunder and lightening when travelling back down the M6. It was worth the effort!! Siobhan was awarded 'Best Juvenile' with Melody and had the runner up as well with Twiglet - but most impressively our Dolly Daydream made her debut and was awarded a fantastic Special rosette! We took a very small band of our finest to Penrith as we have a number of shows to attend a very short time. To see how the adventure team did please click on Dolly Daydream, Snowman, Twiglet, All that Jazz, Lovebug, and Melody. October 2013 - after travelling all over the UK for the past two months, it was nice to only travel 20 minutes to attend a show! 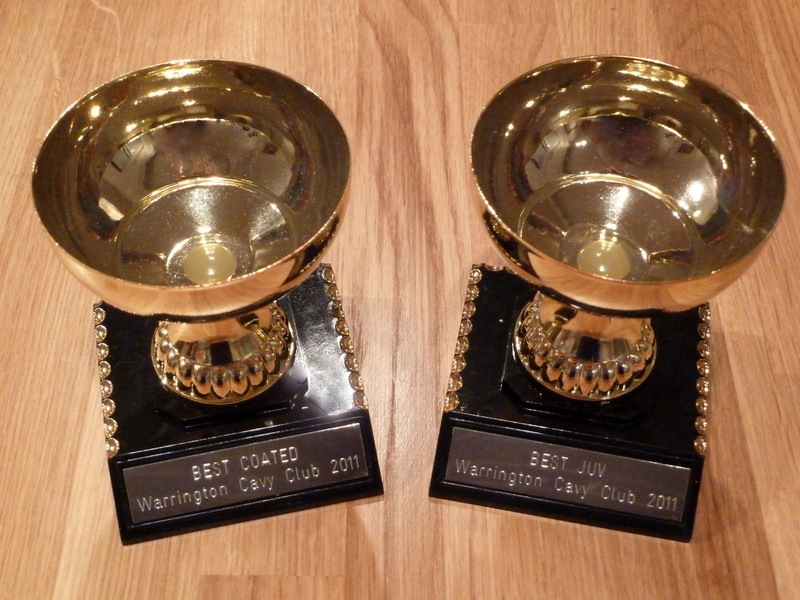 The Warrington club has grown a lot over the past couple of years and the competition is really impressive. We really appreciated the Halloween themed ribbons. Twiglet made her debut and helped Siobhan secure 'Best Juvenile' while Honeycomb continued to shine with 'Best RV Juvenile'. Hazel took her best man to show - Hugo secured 'Best Adult Owned Pet' for her. To see how the local gang did, please click on All that Jazz, Louby Lu, Tiger Lilly, Melody, Snowman, Skyfall, Poppy, Fleur, Twiglet, Honeycomb, Bella, and Hugo. October 2013 - once again we were made welcome in Birmingham! The Birmingham Cavy Club were hosting a 4-star Show. Beauvale took some proven winners and some babes to make their debuts. Siobhan won Best Juvenile and Best Rare Variety for juveniles and was awarded some fantastic trophies. Please click on Melody, Honeycomb, Tiger Lilly, Randolph, All the Jazz, Twiglet, Angel, Ivory, Gilmour, Chester, and Bella to see how they did! October 2013 - the girls took a small group up to Dunblane in Scotland for the Scottish National Cavy Club show. As usual in Scotland, there was fierce competition, amazing hospitality, and fantastic friends. Siobhan brought back 'Best Juvenile' aided by the gorgeous Melody. To see how our international travellers did, please click on Melody, Honeycomb, Channel, Tiger Lilly, Randolph, All the Jazz, and Chocopop! Beauvale Melody with her prizes from Lincolnshire! September 2013 - Travelling to Lincolnshire for this show was a monumental journey! We took a number of our favourites and some new some to show business. There were two shows - the Lincolnshire Cavy Club Show and the Northern Cavy Fanciers Show. Beauvale would have loved to have fully participated in both shows. We had some stunning results and some curious outcomes! This was the first time that we showed Melody and she was an absolute star. To see how our merry travelers did, please click on Chocopop, Cider with Rosie, Skyfall, All that Jazz, Ivory, Randolph and Melody. 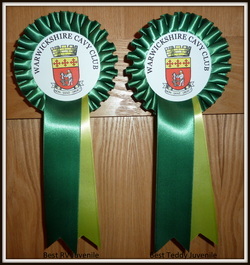 Beauvale Cavies - Oldham Cavy Club Rosettes! September 2013 - what a luxury to only have to travel to Oldham for this show! We were able to set off at a reasonable hour and arrived home in time for tea! Hooray! As with every Oldham Cavy Club show, there was a lot going on! We met up with old friends and met some new ones! That's always exciting! Even more exciting, we took the newest Beauvale Cavy family members to this show. A few weeks ago, Hazel and Siobhan were in a national pet store and couldn't resist adopting two lovely young ladies - Bella and Bonnie! They did well in the pet classes in Oldham! It just goes to show, everyone earns their keep at Beauvale - if you're not showing, your cuddling; or both!! All that Jazz once again was selected Best of Breed in the Teddy class and was awarded Third Best in Show! To see how out little band did in Oldham, please click on Angel, Bonnie, Bella, Harley, Chocopop, Lincoln, Randolph, Ivory, and All that Jazz! September 2013 - what an exciting day at the Romiley Young Farmers Show. Siobhan took some of her craft work to the show and won a number of prizes for her skillful arts and crafts. Her 1st and 2nd place awards were enough for her to bring home this year's trophy and a couple of large rosettes for Handicrafts. Well done Siobhan! We're proud of you and your efforts. In the meantime, Beauvale placed 1st, 2nd, and 3rd in the Teddy 5/8 class and fabulous All that Jazz was selected Best Opposite (2nd Best in Show) and Best Teddy in Show. A special mention goes to our lord of the manor - Julles Romano - this was his first show for Beauvale and he brought home some great prizes! To see our little line up did, please click on Honeycomb, Fleur, Angel, Nina, Cider with Rosie, Randolph, Snowman, Lincoln, Piccadilly, All the Jazz, and Julles Romano! September 2013 - our little Snowman worked hard this summer to earn himself 10 NCC Stars! You can see how Snowman earned his stars by scrolling down his page! He's worked really hard this summer to accumulate these stars. Visit his page to see how he earned these stars. Moorgreen & Midlands Show - big day for Beauvale! August 2013 - at the Moorgreen Country Show there were a number of cavy shows going on. Beauvale entered a number of piggies into the Moorgreen Show and the Midlands Cavy Club Shows. It was a busy day for us and our piggies! We had some excellent results but special mentions must go Randolph who managed to get 8 NCC stars in a single day, and Lincoln who helped Siobhan win Best Juvenile again! To see how our band of piggies did in Robin Hood Country, please click on Little Lady, Skyfall, All that Jazz, Gingernut, Snowman, Victoria, Moonbeam, J'aimee, Piccadilly, Randolph, Lincoln, Bliss, Stargazer, and Cider with Rosie. Beauvale sweeps 1-2-3 in the Challenges! August 2013 - Cumbria was very exciting for Beauvale. Hazel and Siobhan were buzzing when they journeyed back down the M6 from Penrith to Culcheth! The show was a huge success for the organisers, for most of the exhibitors, and for Beauvale! This was a day of 1-2-3 as Beauvale brought home all three prizes for a number of Challenges. 1-2-3 for Juvenile Challenge AA. As if that wasn't enough, Hazel was able to bring home 1-2 in the Coated Challenge Adult. To see how each of our piggies contributed to the big day, please click on Poppy, Piccadilly, Bliss, Gingernut, Lovebug, All that Jazz, Lincoln, Skyfall, Cider with Rosie, Patience, Victoria, Nina, and Ruby! August 2013 - it took us a while to get the consistency to win National Cavy Club 'star' awards. Although we have won numerous awards at various shows, it was down to having bigger group of piggies to select for shows! Gingernut is our first Teddy to get 10 stars and be awarded this fantastic certificate! You can see how Gingernut earned this certificate by scrolling down her page and reviewing her show awards! August 2013 - this Halifax show was a good day out for Beauvale. As with most agricultural shows, there was a lot going on and following the judging the girls had time to indulge in their other passion - shopping! This show was important for us, as we debuted several new additions to Beauvale - and we were overwhelmed with the results. All That Jazz was selected Third Best in Show, while our new Skyfall was selected Fourth Best in Show! It's always difficult to decide which piggies get to go to the show but it's fair to say, that we picked the right ones this week! To see how our lucky few did at the show, click on Skyfall, Bliss, Angel, Piccadilly, Patience, Lovebug, Little Lady, and All That Jazz. Lincoln sweeps up at Betley! August 2013 - the Betley Agricultural Show was combined with a Sandbach Cavy Club Show. As usual with big shows, there was a large variety of piggies to see and admire! You can spend all day just going from pen to pen and lovingly gaze at the occupants - well maybe not everyone, but I could!! After the sweltering heat in July, it was nice to get a cooler day to show at Betley. Once again, we were able to meet up with our special friends and share the latest developments, gossip and recipes (ok, not recipes)! Beauvale did extremely well at Betley, our Lincoln was selected as Best Boar, Best in Show,and Best Bi-colour Agouti. While All that Jazz was selected Second Best Boar. We also brought home First and Third prizes for Best in Show. Many of our younger ones had their debuts and were outstanding! We're very pleased with the weekend's results. To see how our merry band did, click on Lincoln, Piccadilly, Bliss, All that Jazz, Gingernut, Priscilla, Brandy Snap, Angel, J'aimee, Cider with Rosie, and Fleur! June 2013 - the Dunfermline & District Show was a combined club and NCC show! There were loads of wonderful piggies to see and the atmosphere was welcoming and friendly. This show was Beauvale's third in the month of June - all being big shows where we showed a variety of our Teddy and Swiss piggies. Travelling to this show in Dunfermline would not have been possible for us without the wonderful support and hospitality of Kirsty Alexander - a really big and special 'THANK YOU' for making us feel welcome! Nine of our piggies brought home prizes from Dunfermline. We always feel that our troop does well with Jaffa Cake taking the plaudits this week! To see how the travelers did click on Gilmour, Kaleidoscope, J'aimee, Phoenix, Brandy Snap, Thornton, Bliss, Gingernut, and Jaffa Cake. Beauvale Cavies - Phoenix wins big at Cheshire! June 2013 - this show was quickly on the heels of the Honley Show, but the girls did a sterling job getting their piggies ready and were relentless in pursuit of prizes! Siobhan snapped up 1, 2, 3 in Juvenile with Phoenix, Bliss, and Stargazer. Beauvale also brought home 1st, 2nd, and 3rd in the Teddy u/5 class with Phoenix, Gingernut, and All that Jazz. Then 1st in the Teddy 5/8 class with Kaleidoscope while out little Peanut placed 2nd in the Teddy adult class! Nina managed to impress in the Pet class and brought home 2nd prize for 'best rough coated pet'. The girls were especially proud that in the 99 entries in the Non-self Overall Challenge, Phoenix was 2nd and Gingernut was 3rd. But the highlight of the day was Phoenix being judged 3rd Best in Show! To see our little group did, please click on Bliss, All that Jazz, Nina, Jaffa, Bubblicious, Gingernut, Jack Sparrow, Kaleidoscope, Brandy Snap, J'aimee, Stargazer, Peanut, and Phoenix! Beauvale Cavies - Chance - trophy winner! June 2013 - it was an exhilarating, exhausting, exceptional day for Beauvale. We place 1st and 2nd in the Teddy U/5 class with Gingernut taking best in the class. Siobhan was rewarded with a trophy for Best Juvenile with Chance. We are so pleased that our piggies are doing well. To see how they did, please click on Jaffa, Jack Sparrow, J'aimee, Chester, Miwok, Bubblicious, Kaleidoscope, Gingernut, Bliss, and Chance! May 2013 - we traveled back down the M6 to attend the Staffordshire County Show hosted by the Birmingham Cavy Club. The hustle and bustle of an agricultural show doesn't suit everyone but we persevered and came away with nice results. Once again, we were well looked after by our Birmingham hosts. We would like to thank Rob Pitcher-Banks for taking so many lovely photos of our piggies - please click on the collage above to see his excellent work! We took another big group of piggies down the M6! Gilmour, Kaleidoscope, J'aimee, Roberto, Thornton. May 2013 - this was Beauvale's first time participating in the Birmingham Cavy Club Show and it certainly will not be our last! We were welcomed with open arms by all, especially Margaret Thorpe who made sure that we were looked after! It's people like Margaret that makes the day go smoothly and we certainly appreciate her kindness. 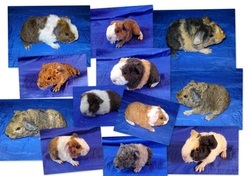 To find out more about the Birmingham Cavy Club, click on: http://birminghamcavyclub.weebly.com/index.html. We took a big group of piggies to Birmingham and they all won something! How fantastic is that? To see how they did, please click on Lovebug, Jaffa, Bliss, Stargazer, Gingernut, Snowman, Chester, Phoenix, Gilmour, Kaleidoscope, J'aimee, Roberto, Dougal, and Nina. Nina did particularly well on the day! What a special girl. May 2013 - this was a combined Oldham Cavy Club and a Teddy Cavy Club show held on the 5th May. Although we knew what to expect from the well-organised Oldham Cavy Club, we were pleased with our first experience of a Teddy Cavy Club show! Many thanks to the organisers for their hard work and dedication. Siobhan is doing some outstanding work in the juvenile categories for both Teddy and Swiss breeds. 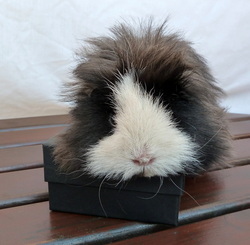 She was rewarded with 'Best Juvenile in Show' by the Teddy Cavy Club for Roberto and 'Best Rare Variety Juvenile' in the Oldham show for Miwok. To see how the rest of the Beauvale piggies performed, please click on Dougal, Miwok, Beanie, Mistletoe, Gingernut, Kaleidoscope, Stargazer, Phoenix, Gilmour, Roberto, and Chester. April 2013 - it was another early start for the girls when they left with a boot full of piggies for the Cumbria Cavy Club Show in Penrith. Some of the piggies were shown on the day, and others were sent on to new homes! The atmosphere at this show was outstanding! We met old friends and made new ones! We traded piggy tales and we gossiped - and we brought home loads of prizes! All-in-all, a very satisfactory day! To see how Beauvale's little group did on the day, please click on Dougal, Beanie, Miwok, Phoenix, Roberto, Stargazer, Chester, Mistletoe, Kaleidoscope and Gilmour. Two trophies for the girls! Beauvale Cavies - trophies for the cabinet! April 2013 - the girls brought home these little gems from the Warrington show. For the second year running, Hazel was awarded 'Best Coated' for the year; and Siobhan was awarded 'Best Juvenile'. Congrats to you both - it's good see you rewarded for all of your hard work! April 2013 - this was a huge show for Beauvale Cavies. Many of you know that we are expanding Beauvale to include Swiss cavies. These are lovely and we only have a few but they are doing well at the shows! This show was a combined Warrington and District Cavy Club and Northern Cavy Fanciers Shows. That means that every pig gets to show in both shows where appropriate. Beauvale brought home 68 prizes, 7 rosettes, and a couple of trophies! To see what each piggy did, please click on Stargazer, Dougal, Miwok, Kiss, Phoenix, Mistletoe, Moonshadow, Kaleidoscope, and Roberto. March 2013 - the Oldham Cavy Club Show is the latest in a long series of shows for Beauvale. We debuted some newbies in Oldham as well as showed some old favourites! To see what our piggies brought home, please click on Miwok, Mistletoe, Trixie, Harley, Roberto Romano, and the newbies - Hershey's Kiss, Stargazer, and Kaleidoscope! March 2013 - Warrington is our local show and we really enjoy the day. The show was really well organised and the participation by all was excellent. We want to thank Ray and Sabina of RnB Stud for all of their efforts - this show would not have happened without you. 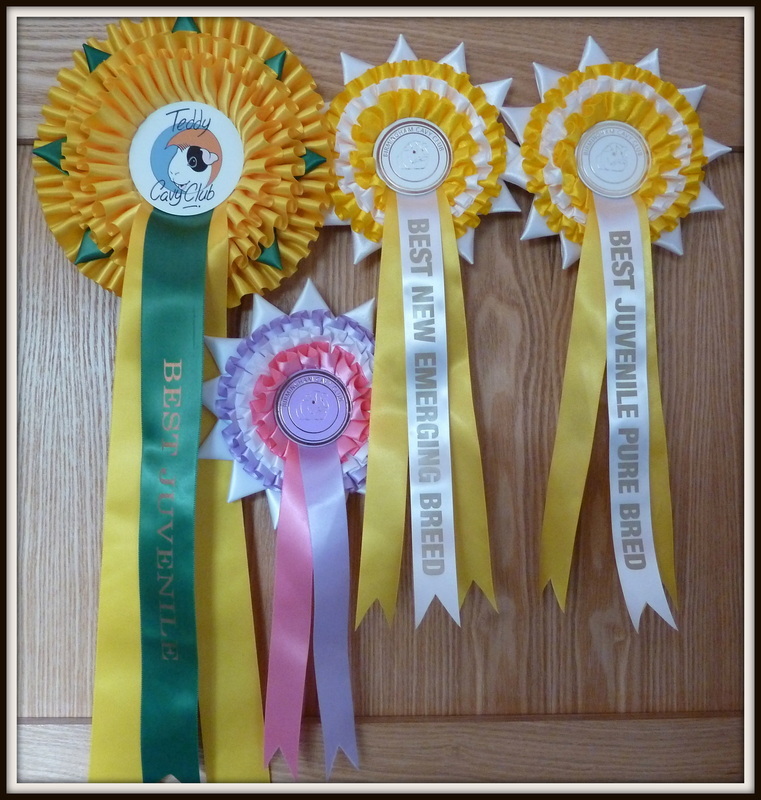 Our little band of furry mischief brought home a fantastic haul of prizes and rosettes! To see how our tribe did, please click on Miwok, MacDougal, Brandy Snap, Mistletoe, Harley, Roberto Romano, and Trixie! March 2013 - no, they're not really mad (well maybe they are)! Hazel and Siobhan traveled to Scotland once again to attend a show! They took a small group of our finest to the Scottish National Show and all came away with a prize! We want to thank Kirsty once again for her hospitality and friendship - we would not have been able to attend this show without her continuing support. To see how our little troupe did, please click on Roberto Romano, Fruitcake, Brandy Snap, Peanut and Nutmeg! February 2013 - there is a big run of shows coming up - so we took a large group to this event in Sandbach. We were really pleased with the day's results. To see our troupe did, please click on MacDougal, Peanut, Moonshadow, Nutmeg, Trixie, Miwok, Roberto Romano, Butterscotch, Brandy Snap, and Harley! January 2013 - this was the first time that Beauvale attended the Harrogate Show. We didn't really know what to expect - and we really didn't expect the blizzard that rocked the Pennines on the Friday night! We took only a handful of piggies as this was a two-day show. Well, they made us proud - a real mixture of prizes and our first rosettes of 2013! To see how they did, click on Chester, Fruitcake, and our new star - Roberto Romano! December 2012 - after all of the hard work that Hazel and Siobhan have put into Beauvale this year, we thought that it was appropriate that we celebrated their successes this year with our 'rosette tree'. Hazel decorated this tree for us this year and we absolutely love it! Of course, the girls could not have done this without the help of their many little friends - so they would like to thank our ever-growing collection of piggies for their many contributions and hours and hours of love and comfort! Finally, we would like to thank all of our friends who visit and support Beauvale Cavies throughout the year! December 2012 - it was an amazing day out at the Hyde & Glossop Cavy Club Show. We took some of our faithful Teddy piggies and a couple of our new Swiss clan. They all proved a hit at the show! 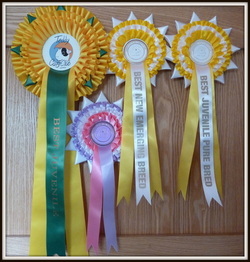 Brandy Snap and MacDougal brought home beautiful rosettes while the others brought home their fair share of prizes! To see how they did, click on Brandy Snap, MacCloud, Fruitcake, MacDougal, Olive, Badger, Chester, Beanie, Ted E., and Peanut. Overall, a fantastic Christmas season show for Beauvale! November 2012 - it was an early start in the cold mist and fog - trekking over the Penines to participate in the Durham and Northumberland Cavy Club show. We took only a handful of our finest and they did us proud on the day! Beauvale managed 1st, 2nd, and 3rd place finishes in the Teddy Adult category and while Siobhan did the same in the juvenile categories. What an exciting day for Beauvale! To see how they did, click on Chester, Aimee, Ted E., Amber or Sunshine! It's official - Aimee is prettiest! October 2012 - we always look forward to the Hyde & Glossop show, so many friends, so many pigs, so much gossip! We took a small group of our piggies to the show as most of our girls are rather busy at the moment. In addition to winning some great prizes, we found a 'Pumpkin' and a 'Beanie' and brought them home too. You will have to wait to be introduced to them...! Terrible teases aren't we? To see how our small troop did, click on Ted E., Chester, and Aimee. October 2012 - the Warrington Show brought out the best in the area! We saw some fantastic Teddys at this show and we're pleased that so many made the effort to join us on the day. We had a mixed set of results, with Chester taking home the ribbon for Beauvale. To see how they did, click on Chester, Sunshine, Blossom, Ted E., and Diamond. September 2012 - it was a big show weekend. Oldham Cavy Club show was on Saturday and the Romiley Young Farmers Club Show was on Sunday. Hazel and Siobhan took only a few pigs to show on each day. Although they were exhausted on Sunday night, they were smiling - not just from winning prizes, but because they saw so many new folks showing their piggies. Hazel commented that this lot were now hooked on showing! Beauvale had a mixed bag of results on the weekend. The Oldham Show was tough - tough competition, tough judging. The Romiley Show was better for us - but then again, we had Nina and Gretal with us. For Oldham results click on: Ted E., Chester, and Lucy. For Romiley results click on: Ted E., Chester, Gretal, Diamond, Fruitcake, and Nina. 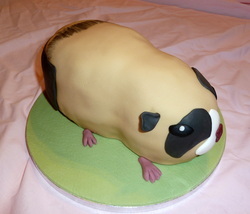 August 2012 - the Poynton Horticultural and Agricultural Show marked Beauvale's 2nd Anniversary in showing guinea pigs! Two years ago, our Cookie won 'Best Rare Variety Cavy' and 'Best of Breed' and she was the very first post on this web site! We have since welcomed many new faces, seen some others go, and made many, many new friends! The Poynton show was good for us again this year as we brought home 8 huge rosettes and MacDougal, Lucy, and Diamond made their debuts. The star of the show for Beauvale was once again, Nina with Chester and Ted E. bringing home more prizes! Click on Nina, Chester, MacDougal, Bailey, Erik, Lucy, Diamond, and Ted E. to see how they did. August 2012 - Holly and Sunshine Surprise produced these gorgeous babies. They were born on the 21 August and are really lively. We're pleased to say that they are all staying at Beauvale! July 2012 - it was a long way to travel to participate in a show but we're certainly glad that we did! It was a well attended show and we saw some familiar faces - we even recognised some of the people! Our Moonbeam and Holly were the big winners for us with Moonbeam placing 3rd 'Best in Show' overall. Imagine that, a Teddy taking such high honours! Holly helped Siobhan take 'Best Juvenile' again. We want to thank Kirsty for her hospitality and encouragement - we could not have attended this show without your help. Click on Moonbeam, Sunbeam, Brandy Snap, Holly, Amber, Chester, and Ted E. to see how they did. June 2012 - it was nice day in the Cheshire countryside for the show. After weeks and weeks of rain, we made the most of a couple of dry days! Our cheeky pigs did really well on the day, especially Amber who brought home some lovely prizes and rosettes. This was Pip's first show and wow - she won her class and showed well in the challenges. Hazel and Siobhan have worked tirelessly to prepare our winter babies for the summer shows! Nice one girls - your hard work is paying off - just look at these beauties! Click on Sunbeam, Moonbeam, Angel, Pip, Holly and Amber to see how they did! June 2012 - after getting rained out at the Honley Show the previous week, it was touch-and-go for the Todmorden Agricultural Show. Well, the show must go on - and once again, we were very pleased with the results! Erik returned to Todmorden and once again topped his Class, but this was very clearly Holly's big show! She brought home a rosette with her four First place finishes. This was our little Chester's first show, bless him he tried really hard to fit in and be brave! If you want to know why you shouldn't spoil your piggies with their favourite foods at a show, you need to see Moonbeam's page. We're gutted that we spoiled her day! Battling knee-deep mud and hip-deep puddles, the tribe brought back some marvellous prizes. Click on Sunbeam, Moonbeam, Sunshine, Angel, Chester, Erik, Sunshine, and Holly to see how they did! May 2012 - the whole family piled into the car and made the two-hour journey to Scotter in Lincolnshire where Sunbeam, Moonbeam, Sunshine Surprise, and Amber participated in the NCC Rare Varieties Cavy Club and the Lincolnshire Cavy Club shows! It was a hot day to be travelling over the Penines, but the competition was hotter! We saw some really wonderful Teddys and we are so pleased to see that this breed is really flourishing! It seems that it doesn't matter how far we travel, our Moonbeam and Sunbeam are still shining bright! Click on Sunbeam, Moonbeam, Amber, Sunshine to see how they did! May 2012 - this week's Warrington Show also included the Northern Cavy Fancier's Show. With two shows in one - it was a really busy day for everyone! Our piggies did double duty and brought home 49 fantastic prizes, 5 rosettes, and a couple of awards! Wow, wow, wow! Although our Sunbeam brought home the lion's share, it was our lovely Nina who once again showed how it was done! Beauvale took Sunbeam, Arian, Bailey, Nina, Moonbeam, Brandy Snap, Amber, Poppy, Sunshine and Erik. To see how they did, please click on their name! May 2012 - although Beauvale took some of our finest pure breed Teddys to the Oldham show - it was Nina who brought home a fantastic selection of prizes. Beauvale were pleased to show Moonbeam, Sunbeam, Brand Snap, Holly, Sunshine, Bailey, Erik and the beautiful Nina. To see how they did, please click on the name above. Peanut and Raisin are destined for good home! May 2012 - how excited are Roisin and Willow? They have been visiting every week since Peanut and Raisin were born so that they don't miss anything! I wish that I had a new hutch and new toys to play with... I'm jealous! April 2012 - The NCC's Yorkshire Championship Show and the Yorkshire Cavy Club's show were held together in Keighley just after Easter. Beauvale took Moonbeam, Sunbeam, Sunshine, Ruby, Brandy Snap and Bailey to Yorkshire for this huge show. 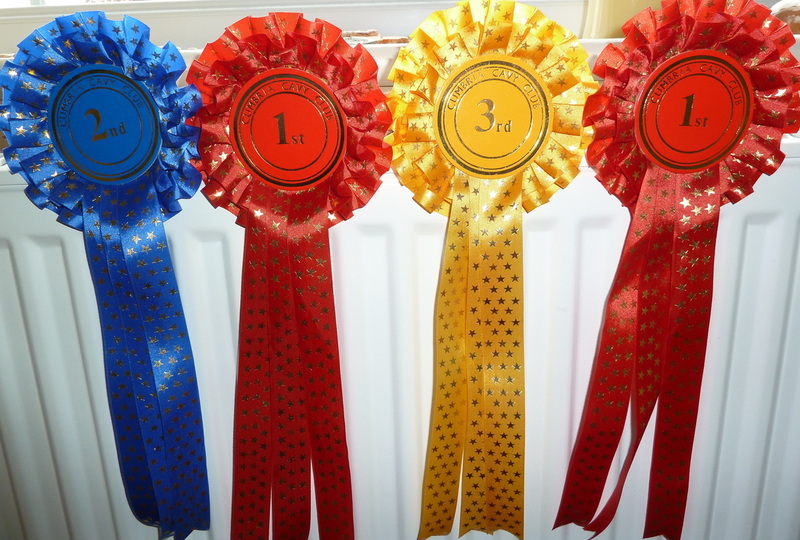 Although Sunbeam and Sunshine did extremely well, they couldn't match Moonbeam's impressive haul of nine first place finishes - not bad for a début showing! To see how everyone did, just click on their name above and follow the link! April 2012 - no it wasn't the Easter Bunny... it was Arian! Emma Dyson offered Beauvale a beautiful silver agouti and white Teddy boar and we snapped him up! Watch his progress on Arian's page. Milly and Ruby have delivered! Beauvale Cavies - Olly and his boys! March 2012 - a few weeks ago, Milly and Ruby have delivered some wonderful babies. Ruby and Barnaby produced 3 boys on 1st March, while Milly and Olly had 2 girls and 2 boys on 24th February. Please see Babies for Sale page for more details. March 2012 - St Patrick's Day was a beautiful day to début Beauvale's latest U5 stock! They claimed 1st, 2nd, and 3rd - what a result..! We're especially proud of Sunbeam and Sunshine! 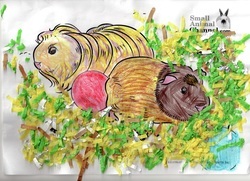 To see how each of our piggies has done, please click on their name - Sunbeam, Sunshine, Holly, Brandy Snap, and Gretal. Spring has returned to Beauvale! December 2011 - what a show! Hazel and Siobhan were buzzing when they returned from the Warrington Christmas show. As well as some of our regulars winning nice prizes - all of our new piggies showed extremely well. There were 9 entrants in the Teddy U/5 class and we had a clean sweep of 1st, 2nd, and 3rd... wow! The two cups shown here were awarded to Beauvale for cumulative points throughout the year for Best Coated; and to Siobhan for Best Juvenile. We're extremely proud of both honours! Trixie, Milly, Honeypot, Jasper, Ruby, Dreamgirl, Olly, Barnaby, and Sunshine Surprise. Siobhan & Matthew's Birthday Cake from the Cake Fairy! 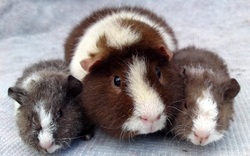 December 2011 - it's not every child that becomes a teenager who appreciates their guinea pig mad family!! Siobhan celebrated her birthday with this wonderful cake from the Cake Fairy! November fine weather and beautiful babies!! November 2011 - although the nights were closing in and the weather remained fine, we moved our expecting girls into the inside hutches! We were rewarded with the most beautiful group of babies that we have seen! Please visit our Babies for Sale page to have a look! 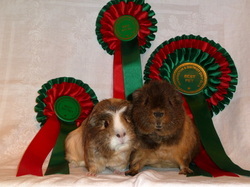 October 2011 - the Warrington & District Cavy Club show was held on 9th October. Our piggies returned with a clutch of rosettes and several First place finishes. Barnaby and Arthur were extremely well received, while Poppy took top class honours for "Best Coated". Our continuing surprise is how well Nina is doing in the shows! She is eye catching with her quirky coat and pleasant disposition. To see how each of our little group did, click on their name -- Poppy, Nina, Barnaby, Erik, Ruby, Milly. 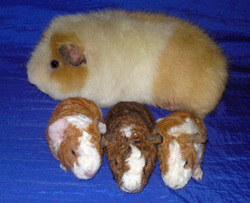 September 2011 - the results from Oldham Cavy Club show were most welcome! Gretal and Nina were amazing - each taking home a number of awards and claiming three rosettes between them. Nina was judged to be 'Most Laid Back' while Gretal was selected 'Best of Breed'. The other Beauvale piggies had good results - Barnaby placed in a tough competition and Mable received her first 1st.To see how each of our piggies did, please click on their name - Nina, Nutmeg, Mable, Gretal, Ruby, and Barnaby. 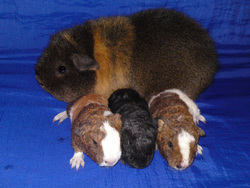 Beauvale Cavies - September Babies! October 2011 - our September babies are just stunning! We have a double birth on 7th September! Blossom and Trixie littered on the same day, Blossom has four daughters and Trixie has 3 sons. A week later, Angel had her babies, 3 girls and a boy. We are very happy with all these babies, Angel and Trixie have done an excellent job of sharing the feeding. As if that wasn't enough, Muffin very quietly and without any fuss whatsoever had her single baby, so quietly that it was only when she was put out into the run and started kicking up a fuss, we realised we had left her enormous baby behind!! What a whopper weighing 125g he is our biggest baby born here and with Erik the proud father we are hopeful that he will follow in both his parents footsteps, so watch this space, we have aptly named him Sunshine Surprise, he will of course be staying here!! Please see our Babies for Sale page to find out where they are going!! Beauvale Cavies - Nutmeg wins the cup! September 2011 - the Romley Young Farmers Club Show was fantastic. The entries from Beauvale did remarkably well with Nina winning Best Pet and taking the Funkiest Hair award! Nutmeg won Best Juvenile while Mable and Gretal had their first shows and finished well. To see how each of our piggies did, please click on their name - Nina, Nutmeg, Mable, Gretal, and Barnaby. 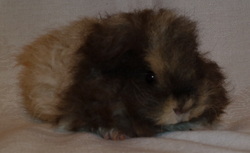 Beauvale Cavies - Tilly's babies! August 2011 - apologies for not updating the web site sooner -we're having a really busy summer! First, Tilly gave birth to five beautiful babies on 23rd July. They're absolutely amazing! Watch the 'Babies for Sale' page to see which ones we are willing to part with...! Second, we want to thank Anne in Denmark for sending over two more beautiful Teddy sows for us. We want to welcome Gretal and Ruby. Both are just settling in after a really, really long journey. We've started building their pages and we expect them to be really popular - if possible, more popular than our Erik! Third, Hazel has had her hands full for most of the summer with boarding! We have been completely booked for August for quite a while. We've had bunnies and guinea pigs and even a neighbour's tortoise for a few days! Lastly, our spring babies are growing nicely and we'll soon release more pictures of Mable, Alice and Hope. All pure breed Teddy sows and all absolutely beautiful.... watch this space. Daisy delights with new family - what a mix! Beauvale Cavies - Daisy's delights! July 2011 - born in the early hours on 9th July, this beautiful litter was produced by Daisy and Merlin. There is such a wide range of colours spread amongst this lot. We're expecting there to be an assortment of hair lengths and styles in this group as well. To see each of the babies, please go to Daisy's page! Taking a theme to the extreme!! Blossom is just so edible! July 2011 - fact - Hazel is guinea pig mad! Mad enough to order her own birthday cake last week from the Cake Fairy. Julie Simmons produced this Blossom-like cake on very short notice so that Hazel could enjoy her birthday in style! Luckily we took a few photos before devouring this masterpiece. Click on the photo to see more pictures and to find the Cake Fairy's details! Thanks Julie - we all enjoyed it! Pure breed Texel pair - absolutely gorgeous! July 2011 - This was a rare offer from Beauvale. We had two lovely pure breed Texel brothers looking for a new home! They are the softest, most gorgeous piggies and have gone to live with Lauren. We hope Lauren had a fantastic birthday! June 2011 - What a huge show! There were over 100 guinea pigs in this show and plenty of competition for every category. Erik was judged 4th over all in the show! What a fantastic achievement for our rising star. Nutmeg was judged Best Juvenile! This is the first time that she's managed this accolade and it won't be the last! She's improving in every show. Trixie and Angel turned in some pleasant results as well. To see how each of our piggies did, please click on their name - Erik, Trixie, Nutmeg, Angel. June 2011 - Erik was judged Best of Breed and Trixie once again stole the show! Oscar and Barnaby were First in their classes. In total 17 more prizes and 2 rosettes. To see how each of our piggies did, please click on their name - Erik, Oscar, Arthur, Barnaby, Trixie, Nutmeg, Angel. 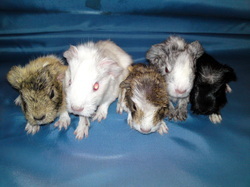 Beauvale Cavies - Cookie's new babies! June 2011 - Born on the 17 June 2011 - Cookie's new babies were amazingly large when delivered in the early hours. Based on the size of each of these, you can easily see that Olly is the proud dad! These babies are currently reserved. June 2011 - on the 11th June, there was a combined cavy show of the Honley Agricultural Show and the Northern Cavy Fanciers Show. Beauvale took eleven of our finest - many for the first time and came away with 53 prizes, 5 rosettes and a plaque. It took us forever to update the site with the results. Among the stunning results, there are two highlights of the show; Oscar was selected Best of Breed and Trixie grabbed eight First place finishes. Erik, Oscar, Arthur, Barnaby, Trixie, Nutmeg, Olly, Sweet Pea, Angel, Blossom, Goldilocks. Pebbles and Max deliver five! June 2011 - Pebbles and Max have produced a lovely family of five pure breed Teddy babies. There are four sows and a boar. These were born on 9th June 2011. June 2011 - Born on 3rd June, these wee ones are absolutely gorgeous. They are 1 day old in these pictures! This lot are a bit wobbly but they are in with Nina and her family so there is lots of copying going on..! Poppet is going to stay at Beauvale and we really like Malteser too - but not quite decided yet. Nina welcomes her first family! May 2011 - In the early hours of Saturday, 28 May 2011, Nina produced a wonderful litter of playful piggies. She's shown here with Kenzo, Sasha and Denzel. Denzel and Kenzo are reserved for Ellie and Sasha is staying at Beauvale! It's been busy and loads of updates! May 2011 - Boarding, building, guestbooks, and babies - we've been doing it all over the past couple of months. We started a new boarding service at Beauvale and it's been an absolute success. We are at capacity for much of the summer but you can still check with us about availability. We have been building new hutches - we've taken all of our experience in building out door hutches and applied it to the 'Palace'. There will be pictures of the Palace on our Set Up page soon. We've had a lot of suggestions from you about how we can improve our website. We have added guestbook as requested. Please leave us your comments when you have a minute. And we're ready to do a couple of more shows in June! So, it's been a busy spring and will be a wonderful summer! We love having you with us at Beauvale..! May 2011 - Just one look at Biscuit and I decided that this cute little bundle must come and live with us; she has Swedish lines and will make a rather nice pairing with Erik our Danish boar. She is now making a home in our newest hutch which she shares with Muffin, and Nutmeg. She has settled in nicely and is growing in confidence every day. Biscuit is extremely quick and agile. She is very inquisitive and has an enormous appetite, we're sure that she will make lots of new friends here at Beauvale. April 2011 - we have finally finished our latest set of hutches and with the nice weather, we are now busy building new pens for the court yard. Beauvale is now taking reservations for boarding our piggy friends. Please see the rate card for further details or call Hazel with questions. March 2011 - Hazel was looking at guinea pigs on the web - as you do, and came across a photo of Marcie on Preloved. She immediately fell in love with this lovely girl. She's gentle and loves to be handled. She will be a calming influence on our young breeding sows. Marcie is too mature to be bred so she is a wonderful addition to our longhaired pets! Best of Breed at Oldham show! March 2011 - It was a great day in Oldham. 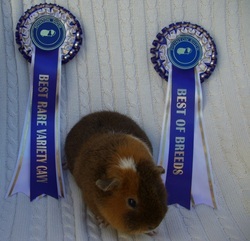 A couple of the lads were selected Best of Breed while our other guinea pigs showed really well. Two of our little girls born at Beauvale were shown for the first time and came away with first prizes! A nice start to their show careers! To see Merlin's results, click here. To see Max's results, click here. To see Trixie's results, click here. To see Olly's results, click here. To see Willow's results, click here. To see Daisy's results, click here. To see Oscar's results, click here. To see Angel's results, click here. To see Cookie's results, click here. Beauvale Cavies - six first place finishes! March 2011 - It was a long but really exciting day for Beauvale at the Warrington show. SIX of our eight piggies came away with at least one First in their class or challenge! 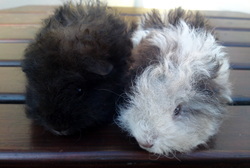 Along with our fantastic Teddy guinea pigs, we're now showing Texels (longhaired) and our guinea pig pets! This was Nina and Lottie's first show! To see Lottie's results, click here. To see Nina's results, click here. Sandbach Show is first of season! 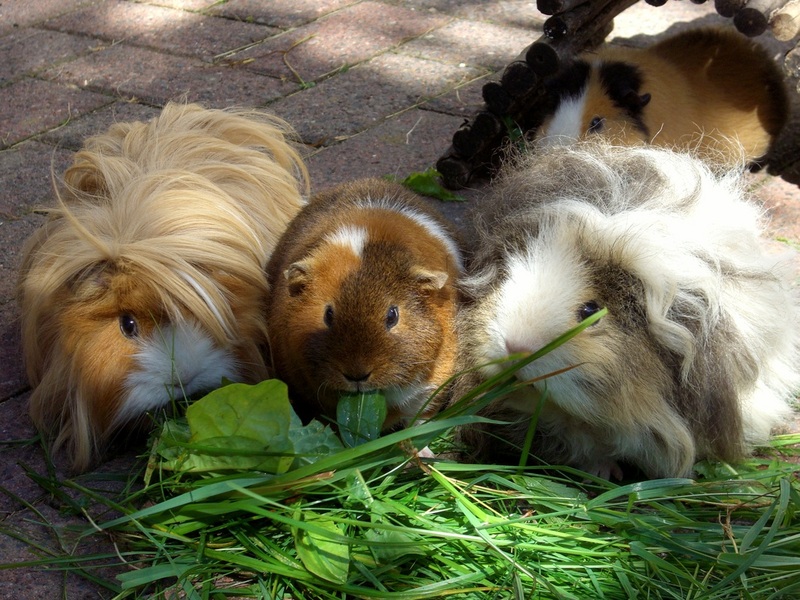 February 2011 - This was the first time that Beauvale showed our wonderful longhaired guinea pigs. Willow was first in her class while Merlin was second in his. They both showed well in the Longhaired Challenge. Daisy was selected Third in her pet class! Muffin has 3 spicy babies! 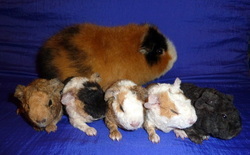 Beauvale Cavies - Muffin's first family! February 2011 - Muffin is the latest of our Teddy girls to have babies. Born on the 23rd February, Ginger, Nutmeg, and Jeeves arrived in the afternoon. Olly is the proud dad. There are more pictures on Muffin's page. Click on the picture or here to see them! 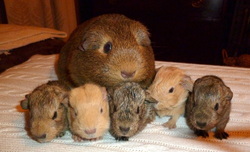 Beauvale Cavies - Poppy's first family! February 2011 - Poppy was ever so patient as she was waiting for her babies. She surprised us at breakfast by showing us her three new babies! This is Poppy and Olly's first babies and they are absolutely gorgeous Teddy guinea pig babies. There are more pictures on Poppy's page. Click here or on the picture to see more. Late Blossom finally arrives with five! February 2011 - Our beautiful Blossom was really starting to struggle with her weight gain - and no wonder! 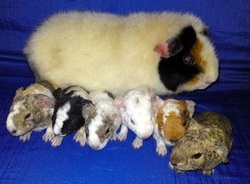 She has delivered five superb Teddy guina pig babies. There are three boys and two girls - and all born with fantastic birth weights. Proud parents are Humphrey and Blossom. Please click on picture or here to see more! 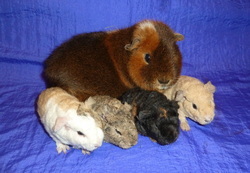 Beauvale Cavies - Pebbles with her SIX..! January 2011 - When Tilly had three babies a while ago and Cookie had four, then Harriet had five, we thought - WoW...!! But now our Pebbles has had SIX beautiful pure breed Teddys. The babies were born on 23 January just after breakfast. Humphrey and Pebbles are now the proud parents of this colourful family. To see more, click here or on the picture. Beauvale Cavies - Tilly & Daisy - Cover Girls! January 2011 - When Pet Gazette were planning their feature on guinea pigs, they asked Beauvale Cavies to supply the images. This is our Tilly and her daughter Daisy on the cover and we have a nice selection of cavies spread throughout the article as well. You can view the pages from January's Pet Gazette here or you can click on the image for a quick view of the pages. We would like to thank Sam at Pet Gazette for selecting Beauvale's piggies and Martha (Violet) Fardoe for taking the pictures for us! January 2011 - Happy New Year everyone..!! We waited and we waited and we waited over the entire Christmas holiday for Harriet and Cookie to give birth and they finally came on 2nd January (Harriet) and 3rd January (Cookie). It was both a relief and a joy to welcome these new arrivals. Harriet had five really large piglets while Cookie had four. Please click on the picture or here to see more of Harriet's babies. Please click on picture or here to see more of Cookie's babies. December 2010 - Hazel visited our local Brownie pack with a few of our prized guinea pigs. Although many of the Brownies had pets of their own, they were amazed by how soft and cuddly guinea pigs actually are! While the visit was fun, it wasn't all about cuddling our furry friends. Hazel spoke with them about caring, feeding and showing guinea pigs. The Brownies were amazed that guinea pigs could actually win prizes in shows! Hazel invited the girls to compete for prizes of their own and handed out colouring sheets from Small Animal Channel.com. The results were truly remarkable. We have put all of the pictures on our Memberships and Links page. Have a look and let us know what you think..!! December 2010 - The girls excelled at the Warrington Christmas show. What a fantastic day! Beauvale took five of our finest and all won prizes. What makes this day extra special for us is that Daisy was born at Beauvale - she's from our first litter!In true star fashion, Poppy continues her come back with several first prizes! To see Poppy's results, click here. To see Muffin's results, click here. To see Oscar's results,click here. November 2010 - We took five of our Teddys to Blackpool and had a fantastic show. Muffin was first in her class and won two RV Challenges. Of course, Max was selected most handsome boar. Our Poppy came third in her class and RV Challenge but was chosen first with 'Most Appealing Face'. To see Poppy's resutls, click here. November 2010 - we have the pleasure of welcoming Merlin - our new Texel boar and Nina - our new Merino Sow. Both have made the journey from Clarky's Cavies in Stoke-on-Trent. 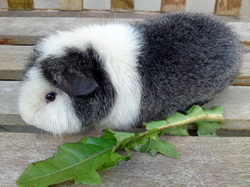 Their pure breed pedigree is a welcome addition to Beauvale's growing selection of guinea pigs. November 2010 - This was a very competitive show and most of our Teddys showed really well. Poppy had missed the last couple of shows but she made a resounding come back at Sandbach. Blossom continued to charm the judges. To see Blossom's results, click here. October 2010 - Although Beauvale Cavies took a handful of guinea pigs to Hyde & Glossop - this was Blossom's show! She continues to wow the judges with her cuteness and charm! October 2010 - Prizes were not the only thing that Beauvale Cavies brought home from the Hyde & Glossop show! Willow stole our hearts and she had to come home with us! Willow is a 5-week old Texel sow and she will soon be joined by Nina, a Merino sow, and Merlin, a Texel boar. Willow had travelled all the way from Leeds and has been bred by Chrissy King. 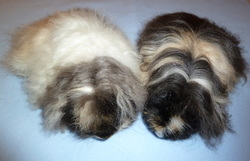 As some of our OAP's are among the longer-haired varieties, we decided to develop Beauvale Cavies stock to include 'funkier' pets. Willow has a sweet nature and is very laid back. Willow has settled in our residential hutch with Abbi & Betty. October 2010 - This was an amazing show for Beauvale Cavies. We took 6 Teddy guinea pigs and they all won awards. We finished the show with 6 First and many other awards including two special awards for Muffin from NCC and Northern Cavy Fanciers. To see Pebble's results, click here. To see Humphrey's results, click here. September 2010 - Tilly, our white crested smooth has given birth to three lovely babies on 30 September. This is Tilly's first little family and we are really excited for her! The father is Kerensky, a friend's tri-coloured Abyssinian who was a real cheeky character. We have been watching these baby guinea pigs grow and grow. Click on the picture for a link to more photos..!! September 2010 - we were very lucky to be given the opportunity to have Olly. He comes to us from St Ambrose Stud - like our Muffin (they're not related). Olly has that 'certain something' - must be the X Factor!! He is a real charmer, making friends very quickly with Humphrey and Oscar - and then moving straight over to the ladies to see who he could charm there too..!! Our son Matthew is totally smitten with Olly and at only 6 weeks, we are certain that he will develop into a little star. Olly is chocolate and white and looks the spitting image of his dad. We hope for some more little Ollys in the future! September 2010 - we took four of our Teddys to the Oldham Show. Max, Humphrey, Blossom and Cookie did their best for us and we came away with several awards for Max and Blossom. This is our second show for us at Beauvale and we are really pleased that our youngsters are showing so well. We are now confident of our Beauvale stock, so watch this space...! August 2010 - we entered the Poynton Show with five of our lovely Teddy Guinea Pigs. We really had no expectations whatsoever as this was our very first show. The idea, like for many, was to go along and learn; then improve for the next local show. Well.... we were shocked!! Cookie (pictured here) our oldest Teddy Sow was exactly what the judge was looking for and she won 'best of breed' and also 'best rare variety' for which we are immensely proud. Our others also did well, although no further rosettes. The 'gang' came away with several more 1st's, 2nd's, and 3rd's.Very exciting for our first time.